When you're serious about trespassers, this sign is for you. 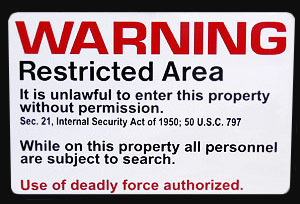 It's the real deal - the "Restricted Area" sign used by the U.S. Military at their high security bases and at the infamous 'Area 51' research facility. This is a professional quality 'all weather' sign. Each individual component of the graphic is cut separately from its specific colored vinyl. The components are then layered by hand to form the completed graphic. The high-quality, all weather vinyl graphics carry a 7-year exposure rating. The sign is heavy gauge 6061-T6 Aluminum alloy. Measures 12" tall x 18" wide.